Now, whenever I create a Modern team or communication site, I am able to set the site's classification value. This value is stored in the site's classification property. 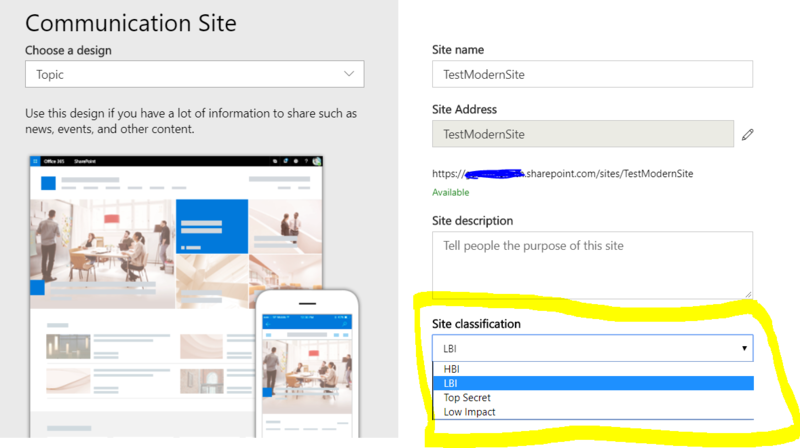 So how do I retrieve this property using SharePoint Search REST endpoints ? Is there any specific managed property that I need to include or map any crawled property ? I couldn't find anything related to it using the Search Query tool or checking via the managed and crawled properties in the Search Schema of the tenant. Appreciate any inputs on this ! You can see the entire property bar for that site. Look for the property that contains your site classification, then you can add it to your selectProperties in your query. Not the answer you're looking for? Browse other questions tagged sharepoint-online search spfx spfx-webparts or ask your own question. Content not returned by SharePoint Search REST API - why? How to update the Site Title and description of modern team site?